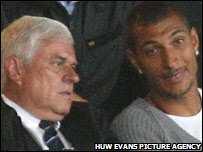 New striker Jay Bothroyd was set to make his Cardiff City debut against Chasetown on Wednesday despite Hull City's late bid to hijack the deal. BBC Sport Wales understands the Premier League new boys made a last-gasp effort to take Bothroyd to Humberside. But Bothroyd stuck by his word to join from Wolves and was set to be included in the Bluebirds' final friendly. The Wolves striker, 26, signed a three-year deal on Monday after passing a medical and agreeing terms. He was a guest of chairman Peter Ridsdale at Friday's friendly with Ajax after a fee of about £300,000 was agreed with Wolves. It brings boss Dave Jones' long search for a second striker to an end with the new season just days away. Is Jay Bothroyd a good signing? First they lost the services of Robbie Fowler, who turned down a new deal at the last minute in favour of a move to Blackburn. Then Marcus Bent called off his move from Charlton at the 11th hour to join Birmingham. And Jones pulled the plug on Kenny Cooper's proposed move from FC Dallas, saying it had been "dragging on too long". But he said of Bothroyd: "I think Jay is a great acquisition for us and we're still on the look-out for more. "He's had maybe one or two seasons where people say he's not fulfilled his potential. "Hopefully we can turn that around for him. We seem to be a club that thrives on doing that with players. "I think he's a quality player and he'd give us something we haven't got and would bring great competition." Ex-Arsenal trainee Bothroyd has played for Coventry City, Perugia, Blackburn Rovers and Charlton Athletic and ended last season on loan at Stoke.